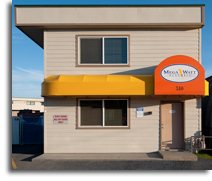 Contact Us | Megawatt Electric, LLC. Electrical Apprentices are hired through the Apprenticeship Program of the local chapter of the Association of Builders and Contractors.Megawatt Electric, LLC is an equal opportunity employer.Megawatt Electric, LLC e-verifies all employees. Megawatt Electric, LLC requires its employees, subcontractors and suppliers to operate according to the company’s Code of Business Ethics and Conduct.